Research of our group is focused on the study of the pathogenic mechanism of virulence factors (toxins and enzymes) from bacterias. These proteins play critical roles in infectious diseases, often in the earliest stages of interaction between pathogenic bacteria and the host organism. Current studies focus on toxins produced by mainly Clostridium perfringens and Bacillus cereus. They are multifunctional proteins and exhibit the ability to affect cellular processes by membrane disruption, pore-dependent cytotoxicity and modification of intracellular target proteins. Through studying such toxins, we expect to better understand the molecular events that contribute to disease and to develop therapeutic inhibitors that will be used to treat disease. 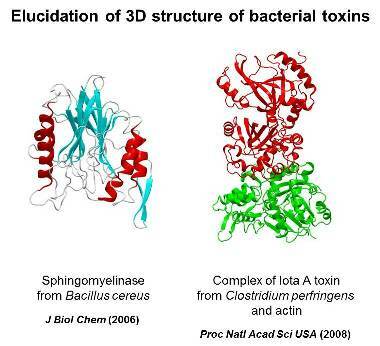 Molecular basis of toxicity of Clostridium perfringens toxins. Molecular mechanism of action and role in gas gangrene of alpha-toxin. Structural baisis for actin ADP-ribosylation of iota-toxin. Pore-forming mechanisms of beta-toxin and epsilon-toxin. Global functional analysis of cellular responses to toxins. lInfection mechanism of Bacillus cereus bacteremia. a. Structure and function relationship of phospholipases. b. Role of phospholipases in pathogenic mechanism. Anti-tumor and immunoadjuvant activities of trehalose dimycolate (TDM) analogues. Our experiments involve a range of methods – fluorescence, protein chemistry, molecular biology, immunology and cell culture. The results of this work are of both theoretical and medical interest. Nagahama M, Takahashi C, Aoyanagi K, Tashiro R, Kobayashi K, Sakaguchi Y, Ishidoh K, Sakura J. Intracellular trafficking of Clostridium botulinum C2 toxin. Toxicon, 82, 76-82 (2014). Nagahama M. Vaccines against Clostridium perfringens alpha-toxin. Curr Pharm Biotechnol, 14(10), 913-917 (2013). Nagahama M, Shibutani M, Seike S, Yonezaki M, Takagishi T, Oda M, Kobayashi K, Sakurai J. The p38 MAPK and JNK pathways protect host cells against Clostridium perfringens beta-toxin. Infect Immun, 81(10), 3703-3708 (2013). Li M, Adams V, Babban TL, Miyamoto K, Garcia JP, Uzal FA, Rood JI, McClane BA. Toxin plasmids of Clostridium perfringens. Microbiol Mol Biol Rev, 77(2), 208-233 (2013). Nagahama M, Oda M, Kobayashi K, Ochi S, Takagishi T, Shibutani M, Sakurai J. A recombinant carboxy-terminal domain of alpha-toxin protects mice against Clostridium perfringens. Microbiol Immunol. 57(5), 340-345 (2013). Yamamoto H, Oda M, Nakano M, Watanabe N, Yabiku K, Shibutani M, Nakanishi T, Suenaga M, Inoue M, Imagawa H, Nagahama M, Matsunaga Y, Himeno S, Setsu K, Sakurai J, Nishizawa M. Concise Synthesis of a Probe Molecule Enabling Analysis and Imaging of Vizantin. Chem Pharm Bull, 61(4), 452-459 (2013). Tsurumura T, Tsumori Y, Qiu H, Oda M, Sakurai J, Nagahama M, Tsuge H. Arginine ADP-ribosylation Mechanism Based on Structural Snapshots of Iota-toxin and Actin Complex. Proc Natl Acad Sci U S A., 110(11), 4267-4272 (2013). Oda M, Fujita A, Okui K, Miyamoto K, Shibutani M, Takagishi T, Kobayashi K, Nagahama M. Bacillus cereus sphingomyelinase recognizes ganglioside GM3, Biochem Biophys Res Commun., 431(2), 164-168 (2013). Oda M, Kabura M, Takagishi T, Suzue A, Tominaga K, Urano S, Nagahama M, Kobayashi K, Furukawa K, Furukawa K, Sakurai J. Clostridium perfringens alpha-toxin recognizes the GM1a/TrkA complex. J Biol Chem, 287(39), 33070-33079 (2012).